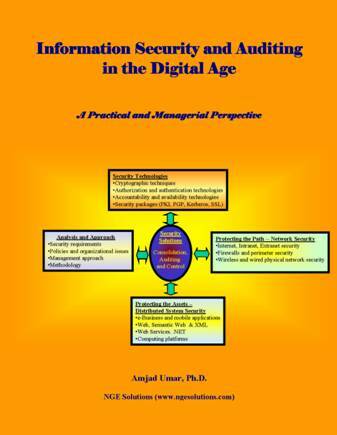 Examination of security risks associated with newer areas such as e-business, mobile applications, XML and Web Services, wireless communications, and application server. Wireless security that includes Wi-Fi security, cellular network security, satellite security, wireless home networking security, and wireless middleware security. Semantic Web security with a discussion of XML security. Web Services security, SAML (Security Assertion Markup Language) and .NET security. Internet security (Public Internet, Intranet, Extranet), firewalls, remote access and perimeter security. Application and database security with emphasis on modern issues such as e-commerce and mobile application security. 2. A systematic approach to build total systems solutions that combine policies, procedures, risk analysis, threat assessment through attack trees, honeypots, and commercially available security packages to secure the IT assets (applications, databases, hosts) as well as the paths (the network) to these assets. 3. Discussion of security technologies (cryptography), authentication, authorization, accountability and availability with emphasis on intrusion detection, intrusion tolerance, and non-repudiation. 4. Discussion of how audits and controls can be used for continued compliance to a solution after deployment. 5. Case study orientation with numerous real-life examples and a single case study that is developed throughout to clarify and illustrate key points. 6. A mixture of management and technical issues for a balanced coverage of the topics. 7. Complete instructor materials (PowerPoint slides, course outline, project assignments) to support an academic or industrial course.